As we already know from media reports and hedge fund investor letters, many hedge funds lost money in October, blaming macroeconomic conditions and unpredictable events that hit several sectors, with healthcare among them. Nevertheless, most investors decided to stick to their bullish theses and their long-term focus allows us to profit from the recent declines. In particular, let’s take a look at what hedge funds think about Clarus Corporation (NASDAQ:CLAR) in this article. Clarus Corporation (NASDAQ:CLAR) was in 10 hedge funds’ portfolios at the end of September. CLAR has experienced an increase in activity from the world’s largest hedge funds lately. There were 10 hedge funds in our database with CLAR holdings at the end of the previous quarter. Despite this, CLAR didn’t come close to be included in the list of the 30 most popular stocks among hedge funds in Q3 of 2018. Readers will be interested to know that board member Nicolas Sokolow was responsible for the last major insider purchase, snapping up 5,076 shares at $7.26 in November 2017. As of this writing the shares were trading at $10.94. Let’s take a gander at the key hedge fund action regarding Clarus Corporation (NASDAQ:CLAR). How are hedge funds trading Clarus Corporation (NASDAQ:CLAR)? At Q3’s end, a total of 10 of the hedge funds tracked by Insider Monkey held long positions in this stock, a change of 0% from one quarter earlier. 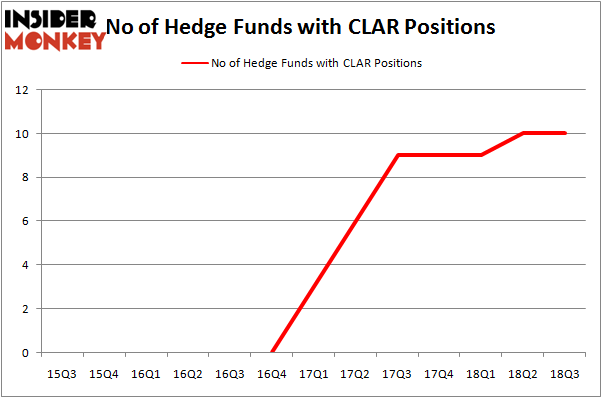 The graph below displays the number of hedge funds with bullish position in CLAR over the last 13 quarters. So, let’s find out which hedge funds were among the top holders of the stock and which hedge funds were making big moves. According to publicly available hedge fund and institutional investor holdings data compiled by Insider Monkey, Greenhouse Funds, managed by Joe Milano, holds the most valuable position in Clarus Corporation (NASDAQ:CLAR). Greenhouse Funds has a $22.7 million position in the stock, comprising 5.5% of its 13F portfolio. 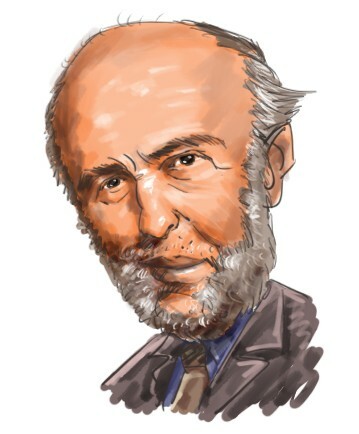 The second most bullish fund manager is Jim Simons of Renaissance Technologies, with a $10.3 million position; less than 0.1%% of its 13F portfolio is allocated to the stock. Some other peers that hold long positions comprise Nelson Obus’s Wynnefield Capital, Mark Broach’s Manatuck Hill Partners and Chuck Royce’s Royce & Associates. We view hedge fund activity in the stock unfavorable, but in this case there was only a single hedge fund selling its entire position: Millennium Management. One hedge fund selling its entire position doesn’t always imply a bearish intent. Theoretically a hedge fund may decide to sell a promising position in order to invest the proceeds in a more promising idea. However, we don’t think this is the case in this case because only one of the 800+ hedge funds tracked by Insider Monkey identified as a viable investment and initiated a position in the stock (that fund was Citadel Investment Group). Let’s go over hedge fund activity in other stocks – not necessarily in the same industry as Clarus Corporation (NASDAQ:CLAR) but similarly valued. These stocks are MiX Telematics Limited (NYSE:MIXT), T2 Biosystems Inc (NASDAQ:TTOO), and Immersion Corporation (NASDAQ:IMMR). This group of stocks’ market valuations are similar to HTA’s market valuation. As you can see these stocks had an average of 12 hedge funds with bullish positions and the average amount invested in these stocks was $65 million. That figure was $53 million in CLAR’s case. Immersion Corporation (NASDAQ:IMMR) is the most popular stock in this table. On the other hand MiX Telematics Limited (NYSE:MIXT) is the least popular one with only 6 bullish hedge fund positions. Clarus Corporation (NASDAQ:CLAR) is not the least popular stock in this group but hedge fund interest is still below average. This is a slightly negative signal and we’d rather spend our time researching stocks that hedge funds are piling on. In this regard IMMR might be a better candidate to consider a long position.